Link building can still be an important part of SEO, and is essentially the process of getting links pointing to your website from other relevant domains. Links can be seen as a kind of voting system used by the search engines to judge the popularity of a site. Links are a way of creating gateways for search engines to index your website and understand how they sit in relation to other sites operating in your industry sector or niche. However, the search engines have spent a great deal of time over the last couple of years refining their algorithms to better judge good quality links. These algorithm updates have been a direct response to the legions of low quality links that have been built over the years as a way to try and build better keyword positions. Building good quality links to your website can help to build preference in search engine rankings, especially if they are relevant backlinks from authority sites. There are many different approaches to link building. However, it is fair to say that if it feels like a link has been achieved too easily then it is probably going to be considered a low value link by the search engines. Think forum spam or large scale guest posting using spun articles with exact match anchor text. If you are creating a low value backlink footprint don’t be surprised if Google come knocking with one of its algorithm updates. Link building is one way to increase the ranking of your website on search engines. However, it is not just the number of links that are taken into consideration, it is very much the quality as mentioned above. For example, a website that has hundreds of low quality backlinks can have a lower rank than one with fewer higher quality links. This is because search engines like Google want relevant websites to rank higher than ones who have just built links anywhere and everywhere. The search engines want to best serve user experience by returning the best results for a given search query. Recent algorithm updates such as Hummingbird are very much focused on trying to better match the right content to specific search queries. Any marketers who try to push the position of average or low quality content in the SERPs by building volumes of low quality backlinks will be fighting a losing battle. This is even more important as you can be penalised for creating irrelevant links, which can greatly impact your ranking. If you are determined to follow this path the chances are that you may already have seen your traffic drop off a cliff with one of the previous Penguin algorithm updates. Links should only be built if they are relevant to the place they are linking from, for example if you are building links for a property company you shouldn’t be looking to do this on a cooking blog! Paid links are not advised as it can be very risky and submitting your site onto generic SEO directories is an example of poor quality link building which can give you negative results in the long run. It is important to have a long term strategy with your link building and it is essential to remember that link building is not a short term solution. Any links and content you post should be adding to the value of the internet and have a topical relevancy to the website they are posted on. It will be important to understand the client’s business and what they might have to offer as part of an outreach programme. Using a questionnaire to understand more about the client can be a useful step before kicking off any link building activity. Again it is important to stress that ‘what the client has to offer’ should automatically default to $ and £ paid to a site owner. This can be tempting particularly as many blog owners are very direct about wanting payment for their time. It is really important to consider what the client may be able to offer that will be of interest people who are interested in their speciality. Creating an amazing piece of content and then leveraging it through a good outreach campaign can still work wonders for building good volumes of high quality links. It is really important to have an understanding of the linking signals the search engines take into consideration. Things like linking neighbourhood, anchor text, theme or topic of post, overall trust of linking site, all play a part in deciding the overall value of an inbound link. Although link building can be seen as a spammy act, as long as it is done within Google’s guidelines and in a natural and relevant way then you shouldn’t see any negative repercussions. In fact, it is important to build a quality backlink profile to help with your search engine ranking and as Google are constantly updating their algorithms it is important to make sure that you stick with quality rather than quantity. The focus should very much be on building exposure as a result of creating high quality content or building high quality relationships. This can cross over with elements of PR. However, ultimately these activities should be complementary rather than conflicting. If link building is simply viewed as a quick and easy tactic to drive rankings it is destined to fail. Outreach is essentially a term to describe the process of developing a relationship with relevant site owners and bloggers. Outreach is a good way of developing long term relationships with site owners. This often involves offering something of value to a site in return for exposure and a link. There are many different things that can be offered, for example, content or products to give away or review. It is important to stress that paying for a link is outside of Google’s T&Cs. To pursue a successful outreach campaign creativity and analysis are needed in equal measures. Why is it important to build a good outreach relationship? During an outreach campaign you will potentially contact hundreds of bloggers who receive lots of similar emails every day. The more you do to create a good relationship with them the more chance you have in receiving a reply and of working with them. It is important to remember that bloggers are savvy to your tactics and have a very good understanding of SEO. Don’t try to confuse them with jargon, you will only end up losing out on opportunities. Bloggers are often part of communities and they all talk. If you have a great relationship with a high value blogger you are likely to get referrals and opportunities to build relationships with similar and relevant bloggers. However, this works both ways, if you have a bad relationship with a blogger you can potentially lose some prospective targets. 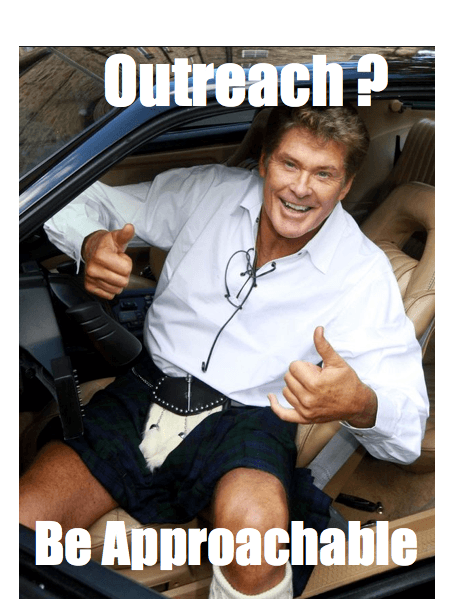 How do I build a good outreach relationship? The best way to start a good relationship with a blogger is by making an effort to get to know them and their website. Anyone can send an email template so it is always important to personalise emails. Look at what topics your target posts about, see what they have been doing recently and make sure that you read their ‘about me’ page and find out their name. Not only will this give you some personal ways to connect to the person you are contacting but it will also help you to see if they are relevant to your outreach campaign. Make sure the blogs you are contacting are relevant, like any link building process you need to make sure that you are linking to a relevant website. If you contact a travel blogger about a cookbook you aren’t going to get a very good response. Once you have established a relationship with a blogger, it is so important to make sure that you keep that relationship going. Make sure you reply to emails quickly, even if they are rejection emails, the blogger you have contacted might not be interested at the moment but they might be interested in something else you have to offer in the future. By taking a minute to reply thoughtfully to emails it can improve your outreach relationship dramatically. Many bloggers make money from their blogs, therefore it is highly unlikely that you will get something for nothing. When you are pitching to a blogger make it as mutually beneficial as possible, is there a product you can ask them to review? Do you have some great content for them, or an interesting infographic? Some bloggers will ask for money, it is important to make sure that you aren’t going against Google’s terms when you are looking for linking opportunities. Don’t try to fool bloggers with ‘benefits’ that won’t make a difference to them, they are very up to speed with SEO and aren’t easily fooled! Use social media to your advantage, Facebook and Twitter give us another opportunity to connect with potential outreach targets. There is a lot of opportunity for starting and developing relationships over social media and they are a great way to start a conversation. This ‘soft approach’ can work well if your client has an active social media profile on a relevant platform. It is also important to be aware of the various social followings of the sites you are building relationships with. If you can gain a link plus generate positive social engagement as a result of the outreach activity this can be a real win. Social sharing signals seem to be ever more important in terms of sending signals to the search engines that a piece of content is proving to be particularly popular. Although search marketers are not entirely sure how the search engines factor these social signals into their algorithms the correlation between strong social engagement and increased visibility within the search results appears to exist. Therefore if you are able to build a relationship with a blogger who has an amazing social following, regularly engaging with what the blogger posts about, the benefits can go well beyond just gaining a link to your site. Most site owners will get hundreds of outreach emails a week, it is important to remember this and make your outreach more personal and memorable. Remember that bloggers are often experts in their field, you can’t expect to fool them or take advantage of them, it is always best be honest. Never completely dismiss a blogger, you might want to work with them in the future, and remember, bloggers talk! There is a wonderful article on Moz about what bloggers think of outreach. It is a great insight into how you can approach bloggers and what they expect from you.